Sprinkle some magic into foods and lunch boxes. Nutritious & Delicious! Magic Sprinkles Lunch Box Bars have been carefully formulated to get more real foods into kids. Organic seeds & superfoods are sprinkled in for a nutrition boost. Made with Certified Organic Ingredients: Coconut, brown rice syrup, cacao powder, cacao nibs, peppermint essential oil, linseed meal, pumpkin seeds, sunflower seeds, goji berries, love & hugs. Made with Certified Organic Ingredients: Coconut, brown rice syrup, vanilla, orange essential oil, linseed meal, pumpkin seeds, sunflower seeds, goji berries, love & hugs. 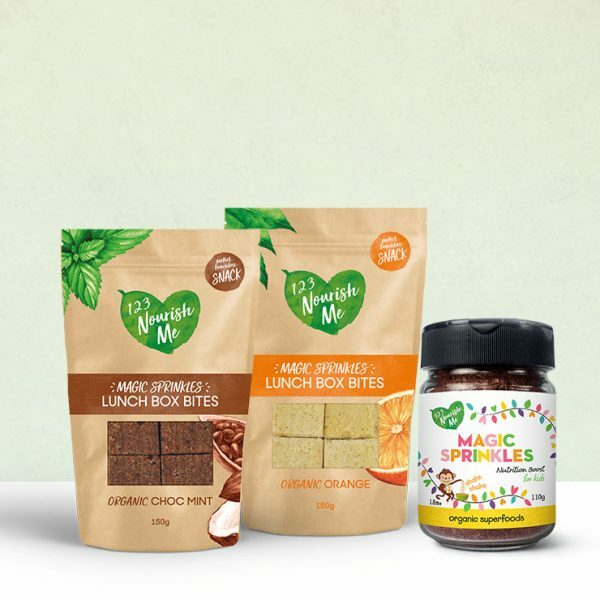 Magic Sprinkles Lunch Box Bars have been carefully formulated to get more real foods into kids. And they’re delicious! Filled with beautiful essential fats, vitamins and minerals coconut is brilliant for many reasons but we use it especially for its ability to feed the brain. Coconuts help promote the production of neurotransmitters as well as myelin. Myelin in the fatty coating that covers neurones and allows them to transmit electrical signals that come from and to the brain more efficiently. Coconut is amazing for protecting the brain helping little people to concentrate and learn. Cacao powder is made from the finest cacao beans and has a decadent and full-bodied chocolate flavour. The beans are extracted from the inside of the Cacao fruit which contains both the beans (seeds) and a white pulp. The beans are separated from the pulp and left to ferment for 5-6 days. Cacao is filled with minerals and rich in magnesium. Cacao nibs is a closer form to the cacao/cocoa bean source. The beans from the cacao/cocoa pods are roasted and then parted from their protective husks and broken down into small pieces. Cacao nibs are rich in iron and fibre. We use the finest quality certified organic peppermint oil safe for ingestion in our lunch box bites. Peppermint Oil used at safe quantities are helpful for stomach pain and digestive issues and is a natural antibacterial. We only use insecticide free sunflower seeds in our magic sprinkles. Sunflower seeds are a great source of vitamins and minerals, especially vitamin E. They are loaded with nutrients and extraordinary health benefits and are fantastic for immune systems and nervous system regulation. Traditionally sunflower seeds were used to treat depression and mood disorders. When we think of sunflowers – they are the flower of happiness and it makes us happy to have these beautiful seeds in our magic sprinkles lunch box bites. Nutritional powerhouse wrapped in a very small package! Pumpkin seeds contain a wide range of nutrients including high levels of magnesium and zinc. We use them because zinc is so important for healthy immune function. Linseeds is one of the most concentrated plant sources of omega 3 fats. We love Linseeds because kids need good quality fats to keep them full and nourish their brains and bodies. Linseeds are also rich in antioxidants, brimming with vitamin B, fabulous fibre, protein and potassium. The main benefit of these gorgeous bright red berries is the high concentration of antioxidants and nutrients. They contain Vitamin A, Vitamin B, Vitamin C, beta carotene, potassium, iron, selenium, calcium, certain trace minerals, zinc, protein, and amino acids — a lot of goodness in a small berry! We love goji’s as they boost immunity, and provide a sweet twist to our magic sprinkles. The most important of our ingredients! Our bites are made with love in small hand cut batches with the finest quality certified organic ingredients. I went from having a child who ate everything to one that was fussy. Having a nutritious snack that she loves has been AMAZING. Knowing that it is only full of good things gives me great peace of mind. Wow the Magic Sprinkles are fabulous! I add it to my boys sandwiches they don’t even notice. Really delicious. The lunch bites are really tasty. My boys liked the orange ones however the choc mints were not as much of the hit my son said the chic chips are funny. Anyway more for me I loved them! Super great healthy snack with a cuppa. Well done 123 Nourish me! 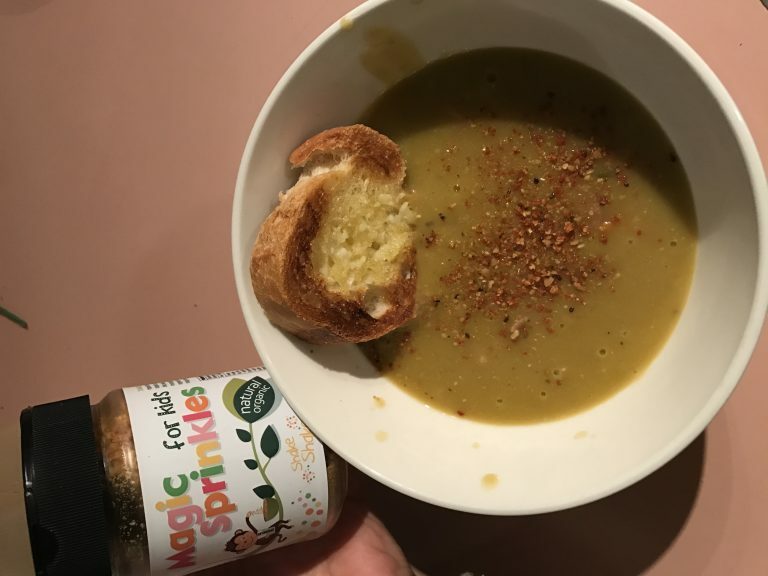 Magic Sprinkles: Wow, amazing, taste great by themselves. Been adding to my children’s sandwiches and they’re enjoying them too! Lunchbox bites: orange are a huge hit with my 17 month old. Easy, quick snack on the go. Choc mint are my little indulgence each day, so delicious and filled with goodness!!! I have put magic sprinkles on my children’s food and they haven’t complained so it’s a win for me. The lunchbox bites were a bit of a miss, it wasn’t to their taste, my 7 year old said that it tasted too much like coconut (which he doesn’t like). Although I do agree that the coconut does overpower the taste a little, I like them especially the choc mint ones. Great way to sneak extra goodness into a fussy toddler. We love the magic sprinkles as our fussy 3 year old has no idea how good they are for him. The lunch box bites are a hit with everyone in the house. Will be odering again soon. The slices are delicious, and my daughter loves her Magic Sprinkles! I am yet to try any recipes but my 3yr old has been sprinkling magic on everything! My big two are 8 and 6 and they really loved the lunch box bites so this was certainly a winning purchase for this mumma! I am loving these!! 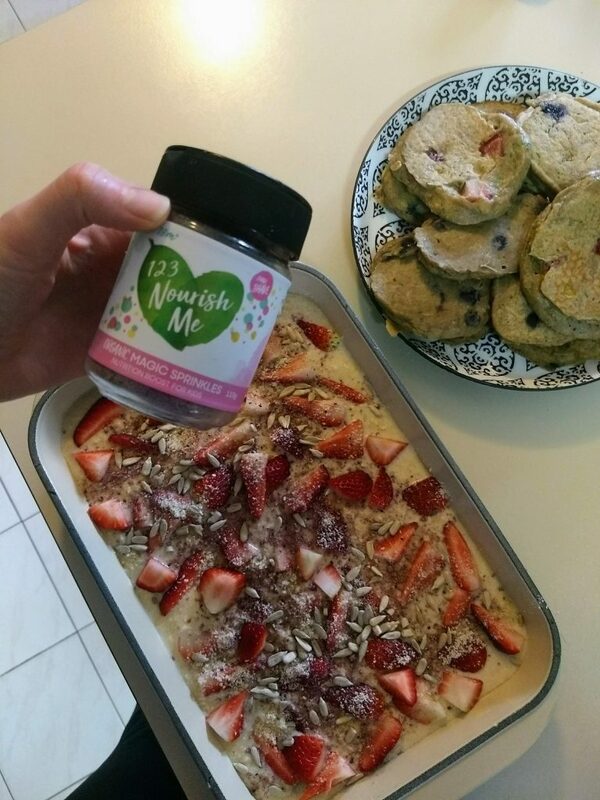 The magic sprinkles are delicious and I pretty much put them on top of everything now from porridge to muffins and pancakes. The kids love them too. Magic sprinkles are great. Easy to add to the kids cereal each morning, or in a smoothie. The lunchbox bites are yum- a bit too much coconut for my 2 kids, but I eat them! The girls have done it again… the magic bites are delicious, personally orange my favourite. Highly recommend you to try them and lil man loved them perfect for school, breakfast, car snack, after sport, and mummies in the run. I am learning to change my habits and have grabbed these instead of something “naughty” this week. New sprinkles are great too we had really missed them. I love sending my son to school knowing he has had a dose of MAGIC brain food . Delicious and so quick and easy to pop in the school lunchbox! Bought 3 of these for my grandchildren for Christmas. Can’t wait to try them myself when they open them. I love being able to give them healthy food. These are even better than the chocolate ones! Delicious, and guilt free. A wonderful find. I have bought the lunch box bites for my Grand daughter. I’m had to try them for myself, delicious. I’ll be buying more of those. Very delicious. My son is reluctant to try new things, so I’m still working on him…but I like them. So delicious i had to hide them from hubby so i can have them all hehe. My son has EoE, “Magic Sprinkles Lunch Box bites” is great.. he can has a tasty healthy treat that is safe for the top 8 diet. Thank you, will definitely recommending this to all EoE mums to try.. Purchased 3 of these for my grandchildren for Christmas. It’s just so great to be able to buy healthy alternatives for them. Can’t wait to try them myself when they open them. I had to test drive! Delicious, and a perfect size. My extremely fussy daughter loves these – so good to know they are full of goodness and perfect for school lunch as they are nut free! My only problem is getting them to last as the whole family loves to tuck into them! Highly recommend.